x-Ray optics, physics of surface and thin films, optical interferometry, the sources of x-ray radiation, the projection lithography. Published about 200 scientific works. the Faculty of Physics and Technology of the Novosibirsk electrotechnical Institute, Department of Electrical installation and accelerators. 1979−1985 — study in the Institute. 1983−1985 — laboratory assistant of the physics laboratory of the Institute of nuclear physics of the Academy of Sciences. In 2008, for the series of works «the Development of multilayer x-ray optics and application in physical experiments and scientific instrument-making industry» awarded the prize of them. A. Mr. Столетова. Renner O., Kopecky M., Krousky E., Schafers F., B. R. Muller, Chkhalo N. I. Properties of laser-sputtered Ti/Be multilayers. Review of Scientific Instruments. Vol. 63. No. 1. January 1992. P. 1478−1481. Chernov V. A., Chkhalo N. I. Fedorchenko, M. V., E. Kruglyakov P., Mytnichenko S. V. Nikitenko, S. G. Study of the Inner Structure of Co/C and Ni/C Multilayers Prepared by Pulsed Laser Evaporation Method. Journal of X-Ray Science and Technology. Vol.5. 1995. P.65−72. Chernov V. A., Chkhalo N. I. Fedorchenko, M. V., E. Kruglyakov P., Mytnichenko S. V. Nikitenko, S. G. Structural Changes Study of Co/C and Ni/C Multilayers upon Annealing. Journal of X-Ray Science and Technology. Vol.5. 1995. P.389−395. Chkhalo N. I., Fedorchenko M. V., Kovalenko N. V., E. Kruglyakov P., Volokhov A. I., Chernov V. A., Mytnichenko S. V.Status of X-ray mirror optics at the Siberian SR Centre. Nuclear Instruments and Methods in Physics Research. A 359. 1995. P. 121−126. Chernov V. A., Chkhalo N. I., Kovalenko N. V., Mytnichenko S. V.
it and performance characteristics of a Ni/C multilayer grating for hard X-rays. Nuclear Instruments and Methods in Physics Research. A 359. 1995. P. 138−140. Chernov V. A., Chkhalo N. I. Nikitenko, S. G. Evolution of Interface Structure in Ni-C Multilayers Depending on Annealing Temperature: Use of Embedded Co Sublayers-Markers. Journal de Physique 4. France. No. 7. 1997. C2−699-C2−700. Carraro L., Puiatti M. E., Scarin P., Valisa M., Chkhalo, N. E. Kruglyakov P. The ultra-soft x-ray multilayer mirror-based duochromator for the reverse field pinch experiment. Review of Scientific Instruments. Vol. 68. No. 1. January 1997. P. 1043−1046. Chkhalo N. I., Kruglyakov e p, Semenov E. P. Optimization of optical components of spectrometers based on multilayer mirrors for soft X-ray radiation. Plasma Devices and Operation. Vol.7. 1999. P. 123−132. Andreev S. S., Akhsakhalyan A. D., Bibishkin M. S., Chkhalo N. I., S. V. Gaponov, S. A. Gusev, Kluenkov E. b., K. A. Prokhorov, N. Salashchenko n, Schafers F., Zuev S. Yu…Multilayer optics for XUV spectral region: technology it and applications. Central European Journal of Physics. CEJP 1. 2003. P. 191−209. 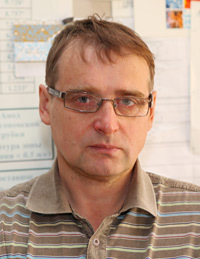 Andreev S. S., Bibishkin M. S., Chkhalo N. I., Lopatin A. Ya., Luchin V. I. Pestov, A. E., K. A. Prokhorov, N. Salashchenko n Application of free-standing multilayer films as polarizers for X-ray radiation. Nuclear Instruments and Methods in Physics Research. A 543. 2005. P. 340−345. Yu.A. ?, A. E. Pestov, K. A. Prokhorov, N. N. Salashchenko, A. A. Fraerman, V. V. Chernov, and N. I. Chkhalo. Analysis of Cross-Correlation of Interface Roughness in Multilayer Structures with Ultrashort Periods. Journal of Experimental and Theoretical Physics. 2006. Vol.103. No. 3. Pp. 346−353.